One of my favorite time signatures is 7/4: a nice lucky count of 1 – 2 – 3 – 4 – 5 – 6 – 7. I’m not sure why. There isn’t a particular song in 7/4 that resonated with me at a crucial early stage of musical development — at least nothing that leapt out at me as being a specific example of that time signature in the same way that songs in, say, 5/4 did. But then when you step back and look at it, there are some really, really big songs that use that time signature. Pink Floyd’s “Money” is probably the most famous. Oh and the verses of The Beatles’ “All You Need Is Love.” And you can see the intro of Rush’s “Limelight” as either 7/4 or alternating sets of 4/4 and 3/4. The point is, these are all songs that don’t really draw attention to their odd time signature in an obvious way. Your ear simply ‘figures out’ where the downbeat is after a couple of listens, and you can get on with enjoying the song. So I thought it might be fun to look at a few different ways to approach this time signature. I find that some time signatures encourage me to write in a way that results in my riffs being a sort of ‘Part A, Part B, half of Part A again’ format, which seems to work really well for things like 5/4. But 7/4 just seems to really flow for me. So I’ve made a little track that features three different ways to play 7/4. You’ll hear them all in the track below, but let’s break them down. The first example (Figure 1 in the tab) is a riff performed with a sort of classic-rock feel (or at least ‘classic Aussie pub rock’ feel), and I play it exclusively with the ring finger of the fretting hand, sliding between the notes. I feel that this adds a sort of slinky, snaky feel to the riff that really suits the dirty rock vibe. 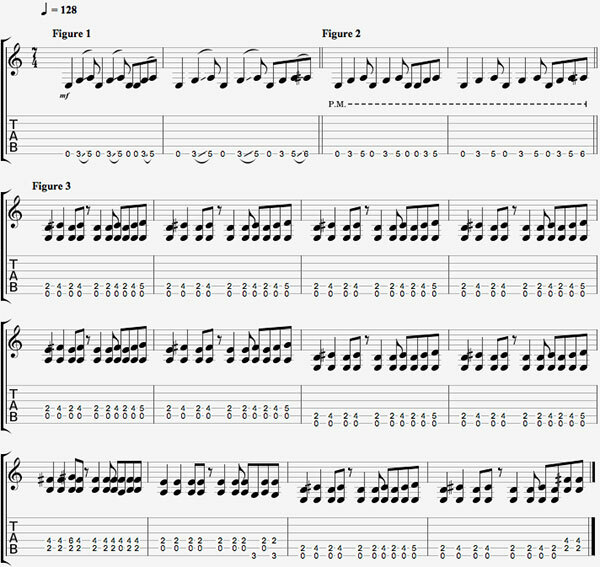 The second, Figure 2, is the exact same notes as Figure 1, but this time it’s played with more of an alternative metal approach somewhere between Tool and Mastodon. I use heavy palm muting to bring out the percussiveness of my Les Paul, and to give the lead guitar somewhere to fit in. The third, Figure 3, is more of a straightforward blues riff built off the good ‘ol I-IV-V pattern, although there’s a sense of thematic continuity with the other riffs: we’re still using the same basic rhythm and we’re also still using a similar set of intervals, it’s just that this time they’re at the top of some chords instead of forming a single-note riff. I plugged my Les Paul Traditional into my Marshall and put all of these into a Soundcloud clip which starts with me noodling along and improvising with octaves and lead licks against the rhythm guitar and bass before the lead guitar drops out and the rest loops on, giving you about 12 minutes’ worth of 7/4 backing track to play along with. I’ve included a section where the rhythm guitar basically plays a single E5 chord so you can really put the focus on the lead guitar and how it maintains the sense of rhythm. The best scale to play over this is E Blues, because it takes advantage of one of my favorite intervals, the flatted fifth. It’s great for switching between evil, ominous metal, angular progressive rock and moody bluesy expression.